Which Genre of Restaurant Do You Prefer? Many chefs think that they can open deeply memorable restaurants with profound emotional depth and remarkable flavors. You might say that these folks are the novelists of the culinary world. However, the great restaurants, like the great novels, are few and far between. More chefs, especially within the past five years, when celebrity became associated with an essentially working class profession, are keen on using their restaurants to tell their own very personal stories. These are like memoirs. A few memoirs give us insight into hidden lives, private experiences, shameful events, and profound resiliences. The problem with most memoirs is their unbelievable indulgence, among many of their authors, and a lack of adequate observation of things outside the self. And aren’t most restaurants that serve food from other countries a lot like reading a book in translation? Rarely as good as the original. It seems that the best books are the ones that show us events, inner and outer, in which the writer is the camera or recorder rather than the self-celebratory object. You can readily say the same for chefs and restaurants: The food should inhabit the imagination of the guest; the guest should think about the food. It would be lovely if chefs had insight into what they do best as individual practitioners of a profession defined by working class values. Leastways that’s what I learned from reading Ozzy’s book about his life in northern England. Here in the Emerald City, the palms are swaying in the gentle breezes and the banjos are playing to accompany the snare drums in the quiet villages where abundance is evident in the baskets of colorful fruits and vegetables. However, just west of here, a mere two hours away, rumor has it that the skies are filling with thick clouds and soon snow will pound down and quiet old fears and ignite new ones. Panic in the streets! Shovels in hands! Men keeling over due to the exertion! And strikes! The dockworkers will return to work. Whew! KIAs on their way! Spares are seen in the bulging tires on midriffs from all the holiday fun. We’re trying to avoid that here in The Haas Test Kitchen with some degree of success. A killer Icelandic leg of lamb roasted at 350 for 90 minutes did the trick last night. I adapted a simple Indian spice rub from Julie Sahni: Garlic, ginger, cumin, oil, dried and hot red pepper, ground cloves, and fresh coriander. Wrap it all up in foil. Prep = 7 minutes. Tonight? I bought a pound of fresh chanterelle in the wholesale section of Russo’s, where I have a new BFF, and will serve the babies up in a broth–maybe–and also some dried spaghetti. Wait: I hear the melody from the window. Surely, it’s not a siren, but a new love. Fair wages and eating sensibly. I interviewed a line cook yesterday who was recently employed at a very well known, small restaurant in Boston: $10 an hour. Do the math. That’s $400 a week, $1600 a month, and $20,000 a year. He got fired because he asked for–insisted upon–a raise. Was the beef he fried grass fed and free range? Was it from cattle raised on sustainable farms? Were the cows fed GMO corn and, if so, was it labeled? In the Days Ahead: Dockworkers Strike! Stymied, ironically, by the many free hours, my productivity has gone down. It seems to be limited to promoting by book, “Back of the House,” through social media and shenanigans. By the latter, I mean telling everyone, from dry cleaner to taxi driver, about it. Meanwhile the not so secret preparations for New Year’s Eve do not abate. We’re talking Alba white truffles–no Tennessee black ones here, thank you very much–and quail eggs and risotto and Japanese beef. You know, a simple repast just like we used to have at Grammie’s. But it’s not just about the food, is it? Is it? It’s about the presents. Right? No, Virginia, wrong holiday. The love? Well, yeah, but do you really need me to tell you that? Well, that’s getting closer. Resolving to be better in the new year. One big thing standing in the way of that is the strike being planned by dockworkers on the East Coast. This would be the first dockworkers strike in 35 years. It will bring things to a crawl. And with organized crime no longer as big a presence on the docks, who will turn things around? It’s that time of year when folks predict what they envision in the world of food over the year ahead. The Sterling-Rice Group does an unusually good job at this sort of prognosticating. Their trends, to be found on their website, are evidence based, it seems, and highly specific: http://www.srg.com. Baum + Whiteman is pretty good, too, though their list of 17 trends veers towards the dramatic and is more opinionated that SRG (noted above). Still, worth a look: http://www.baumwhiteman.com. A terrific website, Nutrition Unplugged, lists many of the sites that are predicting trends. That’s at http://www.nutritionunplugged.com. 1. With the exception of Andrew Carmellini’s new French restaurant opening in 2013, you can expect to see more Italian and Italian-American places opening. For obvious reasons, including: It’s what most cooks are capable of doing, no one ever went broke opening an Italian restaurant, it’s just about the most delicious food on earth. 2. More restaurant workers will demand living wages and better work conditions. The end of the 12 hour cooking shift, five days a week is near. 3. More Chinese people will open “Japanese” restaurants, more Americans will open “French” restaurants. Go and look now at the menus of places that call themselves French. People will always spend more for Japanese and French food. 4. More food writers and people who are passionate about food will predict that more chefs will serve more Asian influenced dishes: Ingredients and dishes from Thailand, Vietnam, India, China, and Japan. Don’t count on it, unfortunately. 5. More food writers and people who are passionate about food will predict that more chefs will serve more vegetables. Well, yeah, ten bucks for Brussels sprouts fried in duck fat? 6. More people will buy more cookbooks that they never use. 7. More people will buy more kitchen appliances. Juicers, dehydrators, beer making kits, and meat grinders. People will limit their reading to instruction manuals. 8. A chef will run for the U.S. Senate and be elected. 9. Another food scandal will occur in China. 10. My book, “Back of the House,” will be on your night stand. Dogs up late and a quick jaunt in the park before returning home to fry Father’s Bourbon Soaked Bacon with Challah French toast and serve with Vermont maple syrup. Blood orange juice, using the electric juicer, and great Porto Rico coffee from Yemen. Presents this year were really lovely: Sweaters, socks, earrings, concert tickets, etc. The singing wreath down the street spooks the dogs, and reminds me a smidge of the fantastic XMAS homes we saw last night. My goodness, it’s so festive. Bird in the oven with corn bread, walnut, and rice stuffing. I get so confused this time of year. Don’t you? Is it Diwali? Hanukah? Kwanza? Wait, I know! It’s Christmas. I do love this time of year. Really. Yesterday, my friend F, who almost single-handedly wrecked the banking system a few years back through reckless loans and mortgage schemes, gave me a wonderful turkey, freshly slaughtered, to roast on Christmas day. And tonight, after the Annual Somerville Christmas Tour–dancing deer, singing wreaths, rooftop sleighs that move–it’ll be truffled pasta and little, baby chickens. Meanwhile, “Back of the House” moves up the charts. Pre-sales at Amazon put us in the top 100 within its category. Gosh, is this the best time of year? The very best? It’s a push and pull between gluttony and refinement, satisfaction and yearning, hope and despair. Well, not despair, but lack of hope. 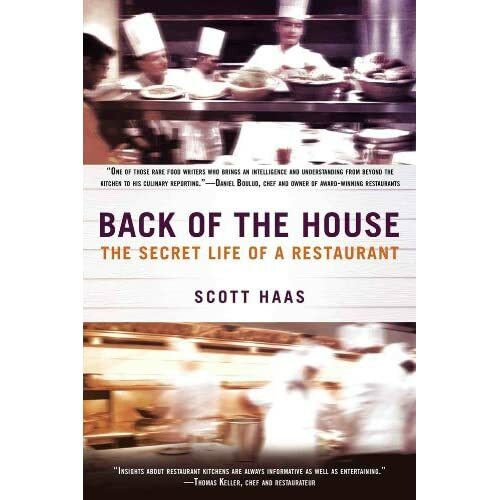 The background noise is Andrew Solomon’s poignant and thoughtful op-ed in today’s NYT; a fascinating and new biography of Walther Rathenau; the puzzle of how to promote my new book, “Back of the House”; and, lingering doubts about why some towns emphasize “creativity” in their restaurants while others place the best ingredients at the center. I know it’s not useful to focus on the incredibly second-rate ingredients showing up on menus of certain incredibly expensive restaurants: Lebanese olive oil rather than French, Italian, or Californian; black truffles from Tennessee rather than France; supermarket bread rather than stuff baked in-house. But are those observations keeping with the Christmas spirit? I mean: What would Jesus do? Would Jesus complain about bad food in expensive restaurants? I think not. So isn’t it better just to focus on the delicious Challah French toast and Tracklement’s bacon and wonderful Northeast Kingdom maple syrup I served this morning? Inspired by the rodents in the trees, on the power lines, and, each spring, in my attic, I search for food this time of year to freeze and store in the pantry in the event of cataclysm. Or something. The latest purchases were Japanese beef and dry aged prime ribeye from the remarkable DeBragga, nuts and dried fruits from the amazing Bella Viva in CA, little baby chickens and chanterelle from Russo’s, bacon from Tracklement’s and Father’s, and, soon, lox and bagels from Russ and Daughters and Barney Greengrass, too. All that remains are fish and vegetables from great local purveyors. And so, we’re ready here. XMAS Eve we’re talking about those baby chickens and truffled pasta from Venice with the chanterelle. XMAS day, we’re talking Icelandic lamb. It’s not Diwali, but it’ll do. Yes, since you asked, last night’s turkey chili was a huge success. There it was, monsoon like rains, but we were ensconced in a room with a fire blazing, lights low, and bowls of little red beans and turkey and spoons and dried Thai chili. And, yes, tonight we’re talking eggplant with burrata. But let me tell you: What’s on my mind is the remarkable story in today’s NYT Business section on Cerberus and its investment in companies that manufacture guns. Renaissance Technologies held 3,395,000 shares or a 5.12% stake, the data shows. RenTech added 1,210,600 shares in the third quarter ended 9/30/2012. Route One Investment Company held 1,242,000 shares or 1.87% stake for the quarter ended 9/30. Route One added 1,242,000 shares during the third quarter. Steelhead Partners LLC owned 1,282,7000 shares or a 1.85% stake. Steelhead sold 450,000 shares during Q3. Columbia Partners had 801,691 shares or a 1.21% stake in Q3. Columbia Partners revealed a new stake of 801,691 shares during the third quarter ended 9/30. Bogle Investment Management held 656,288 shares or a 0.99% stake in the third quarter. Bogle Investment Management sold 1,027 shares in Q3, the data shows. Millennium Management had 618,881 shares or a 0.93% stake for the quarter ended 9/30. Millennium added 470,007 shares during the third quarter. Now here’s a rundown of the six hedge funds with the largest stake in Sturm, Ruger & Co., according to 13F data compiled by Bloomberg for the third quarter ended 9/30/2012. James Investment Research Inc. held 904,360 shares or a 4.27% stake in Q3. James Investment Research sold 2,323 in the third quarter, the data shows. Renaissance Technologies owned 850,900 shares or a 4.44% stake in the third quarter. The hedge fund sold 181,600 shares in Q3, the data shows. Tiger Global Management disclosed a new position of 800,000 shares, or a 4.18% stake, in the third quarter ended 9/30, the data shows. South Point Capital Advisors had 665,963 shares or a 3.48% stake in Q3, according to 13F data. The hedge fund sold 70,100 shares in the third quarter. Valinor Management LLC held 223,620 shares or a 1.17% stake in Q3. Valinor sold 56,040 shares in Q3, the data shows. So go ahead and trade cookie recipes. Do you feel lucky? Well, do ya?